A grieving father has made an appeal to find his daughter's missing mobile phone. 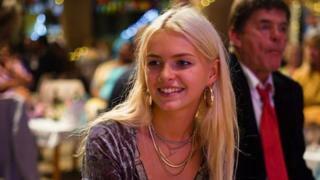 The body of 19-year-old Pearl Bamford was found on the banks of the Truro River in Cornwall on 15 March. Johnny Bamford said the family needs to find her white iPhone 5 which he believes was taken from her backpack at the scene. Ms Bamford's wallet was also missing but was later handed to police, who are not treating her death as suspicious. "I want to square the circle," Mr Bamford said. "Did she contact someone on Whatsapp or did she talk to someone? "There's also some poignant photographs that she'd taken with her boyfriend, who's incredibly devastated." Mr Bamford, from Crackington Haven near Bude, said: "My plea is that, if someone did take it from her rucksack outside Tesco's, it's got no real value and I'm happy to give them a new one just to have it back so that we can process our grief, no questions asked. "It may give me some answers; it may give me nothing. It's really just a plea from a dad who's lost his daughter and needs to know what happened in the last hours. Image caption Pearl Bamford (right) was described by her father as "hugely charismatic"
A spokesperson from Devon and Cornwall Police said: "We are aware that some items belonging to Pearl have yet to have been located and we continue to review CCTV as part of this."